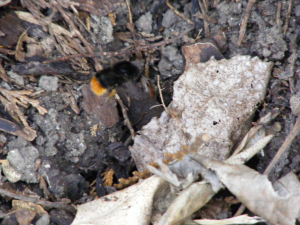 Observation - Bumble Bee entering nest - UK and Ireland. Description: This bees nest is under a Laylandii tree by a wood pile. The bees can be seen coming and going regularly throughout the day usually in twos and threes. This bees nest is under a Laylandii tree by a wood pile. The bees can be seen coming and going regularly throughout the day usually in twos and threes.